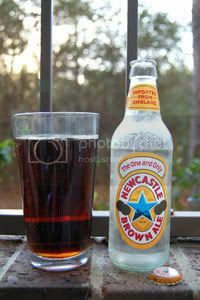 One of the world's classic beers and the standard Brown Ale, Newcastle has been brewed in England since 1927. Known in it's home town as "Dog" (as in "I have to see a man about a dog"), this beer is an absolute icon and I've been a huge fan since I started drinking beer. Verdict: Certainly no where near as good as from a tap, but still a great session beer from the bottle. If you're looking for something a little darker, this is a beer with a real bite you can drink all night long. Good dog. Although this is one of my brands, it is notoriously flat on the tongue. It doesn't have any flavors of nut, biscuit, or toast like Goose Island.